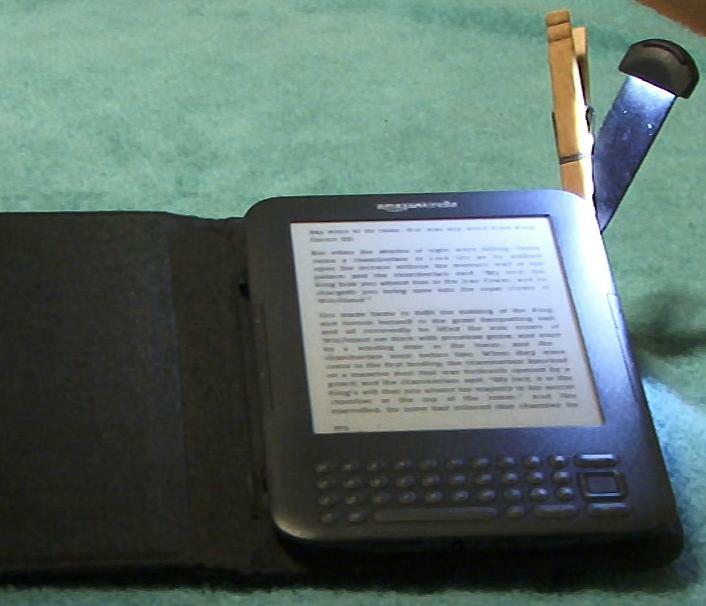 I recently splurged and bought the lighted cover that Amazon sells to go with their Kindle e-reader. And when I say splurge, I really mean it, because this thing is incredibly overpriced at $59 before shipping and/or tax. Best Buy is selling Kindles and covers now, which is where I picked my cover up, so I didn't have to pay shipping, but with tax it was over $65. A ridiculous price for a couple of small sheets of plywood (I'm guessing) covered in imitation leather with a tiny, inexpensive LED light. The markup on this cover must be enormous. The cover is very well made though. Some people may object to the weight, because it at least doubles the weight of the Kindle once you put the cover on it. This is only a problem if you're like me and read lying in bed on your back with the Kindle raised a little above your head. Actually, it doesn't bother me, but I'm a 6'5" man. A small woman or child may have more trouble. At any rate, the cover is sturdy and will give you good protection for your investment. The light pulls out from the upper right-hand corner on a plastic (or more likely vinyl) arm. 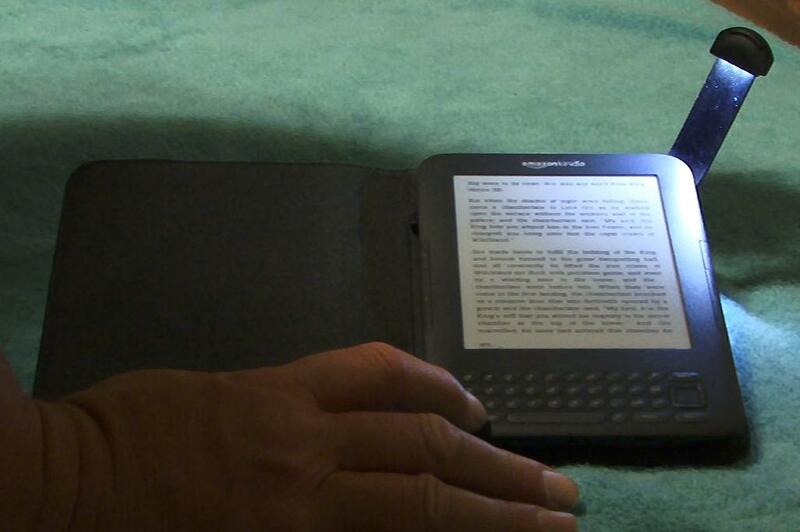 When the light is pulled out, it won't come on until you turn the Kindle on. 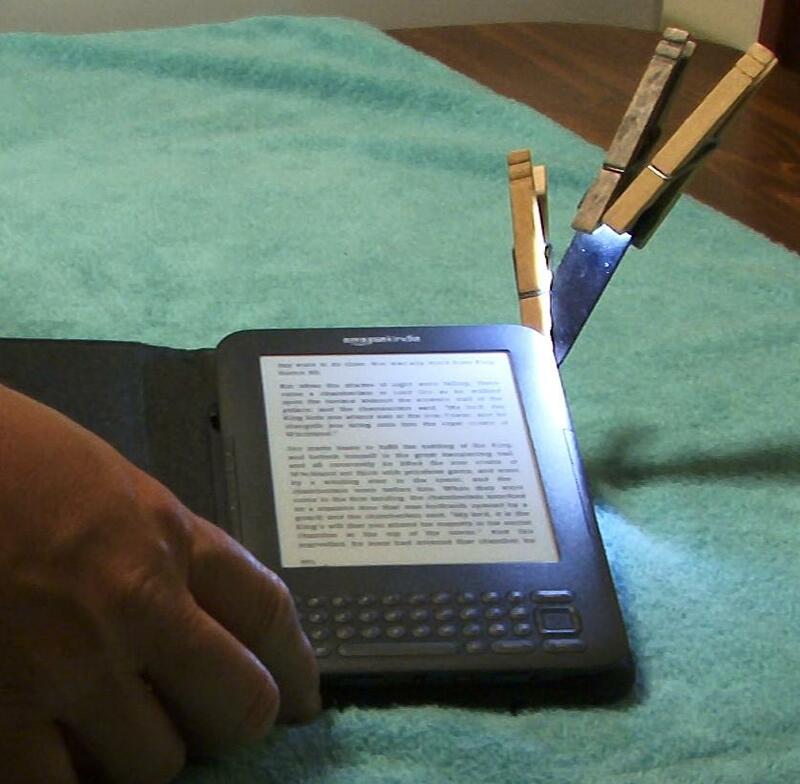 To turn it out, simply push the light back in or turn your Kindle off. The light is composed of three LEDs and emits a strong enough luminance to read by in pitch darkness. It derives its power from the battery in your Kindle. The Kindle attaches to the cover by way of two metal hooks that go into two slots on the left side of the Kindle. It hooks in very easily, and once attached, will stay in place with no problems. Believe me, you won't have to worry about it slipping out. It's a very smart design. It can be a little difficult to read the bottom left-hand side like this. The reason for the difficulty stems from the fact that the light is angled downward a little too much. If I push back about a 1/4" on the light, it illuminates the entire screen just fine. After having looked around on the idiotnet and some Youtube videos, it appears that every unit ships like this. My solution to the problem is to place a clothespin across the bend in the light's arm. Whenever I'm not reading my Kindle, I also hook a pair of clothespins on the top of the light to bend it back even more. This doesn't place very much weight on the arm, and my hope is that I'll eventually cause the arm to bend back just a tad permanently so that I won't have to use clothespins at all someday. I'll post again in the future to let you know if this idea works or not, and how long it takes. Thanks for the excellent review! Let's hope the Kindle folks get the word about the angle of the light so they can mitigate the problem in 'lighted case.2' The clothespins are a brilliant fix, but should never have been a concern to begin with. Where are the designer's brains? Geez. For that overinflated price the design should be flawless. "For that overinflated price the design should be flawless." Boy, isn't that the truth. At least it's Tonka tuff. I think the case will outlast the Kindle. How is the lighted cover working out for you? I received one as a Christmas gift and have had to replace it twice - both times the bottom hook becomes loose and the Kindle is not secure in the case. Have you come across this issue at all? I'm not crazy about the light--it could be brighter and better focussed, but I haven't had any trouble with anything. I've only had it a month though. It still seems very solid at this point. Check back in a couple of months though. If I have any problems I'll post a follow-up. This is an interesting review. Working for an online tech accessories retailer, I come into contact with a lot of fantastic accessories for the the Amazon Kindle and always appreciate customer feedback. I'd be more than happy to Alan. I left you an email. I'm so glad I came across your blog! I live in London and am hoping my family can bring me back a Kindle when they go to America for holiday and I wasn't sure if retailers sold the official cases or not. Do you know if any other retailers sell the case or is it just Best Buy? All their branches (in different states / towns) should have it right? I know the new Kindle Touch is available at quite a few retailers, not sure about the official lighted case? Also its been around 3 months since you got your case right? Hows it holding up? Everything about my Kindle and the cover are still fine. I never could get the light to bend permantently the way I wanted it to, but it works well enough for most people the way it is out of the box. Besides Best Buy, I think I've seen Kindles and covers at Wal-Mart stores too. Yes, any town of 30,000 or more will have a Best Buy and probably a Wal-Mart as well. They shouldn't have any trouble finding one or the other. Yeah, really hope they can find the official Amazon covers at the stores .. fingers crossed! One word of advice: stick with the older style Kindle-3 with the keyboard at the bottom like you see in my photos. The new touch Kindles that are just out are getting very bad reviews so far. It seems the screen is much darker on them.